I’m filing this post under “backup” because we’ve been told many times over to backup your drive like a month or so. Please please do it now if you haven’t. OMG, am I sounding like your dentist (! ), well, he’s right when he tells you to brush your teeth at least 3 times a day… and floss!!! har har har. Ok, ’nuff about teeth, backup these days are equally important though. If you’ve been situated where there was “hair pulling” and “table banging” because you failed to backup, here’s a tool that may make you avoid that horrific episode. The Imation Apollo Pro WX Hard Drive. 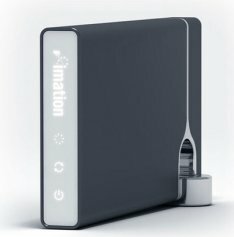 It’s a USB wireless hard drive (comes in 250GB to 1TB storage capacity) that you can hide anywhere within 30 feet AND STILL be able to access as if you’ve got your own “data cloud” at home. Comes pre-packed with data security features that ensures you private and sole access to it. No worries about the neighbors trying to peek in and create havoc with your files. Right now, it works with the Dell Latitude and XPS models AND with Kensington’s four-port Wireless USB Docking Station. Soon enough, I’m sure it will expand its compatibility to a lot of PCs and notebooks. It will be available Q4 of 2008. No price listed yet.